Farnsworth was born near Beaver, Utah on August 19, 1906. His family were members of the The Church of Jesus Christ of Latter-day Saints. His father later moved the family to Rigby, Idaho, where he worked as a sharecropper. Young Philo developed an early interest in electronics after his first telephone conversation with an out-of-state relative and the discovery of a large cache of science magazines in the attic of the family’s new home. After a brief stint in the Navy, Farnsworth returned to Idaho to help support his mother. He later moved to the San Francisco Bay area with his bride, Elma "Pem" Gardner-Farnsworth. 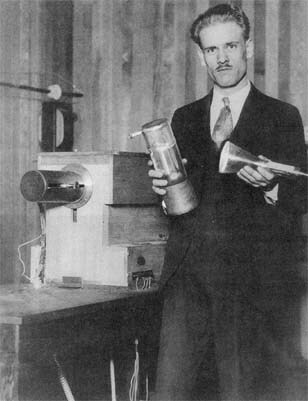 In 1926, Farnsworth formed a partnership with George Everson in Salt Lake City to fund Farnsworth’s television experiments. He moved to California to carry out research. Farnsworth was working on building a practical verison of a camera "eye" pickup tube, which he entitled the Image Dissector, an all-electronic image scanning tube that made it possible to dispense with the moving parts of mechanical television. At this time, only mechanical television could yield actual pictures, while a relatively smaller number of scientists worldwide were working on the problem of how to obtain similar results with fully electronic television. This idea was first suggested by A.A. Campbell Swinton in 1908 and again in 1911, however, he had also said that the idea would have been scarcely worth pursuing. Farnsworth did pursue it however, and in 1927 Farnsworth’s Image Dissector camera tube transmitted its first image, a simple straight line. Popular accounts usually leave out the fact that the source was a slide backlit by a carbon arc lamp, and there were still mechanical components. There was much work left to do. By 1928 Farnsworth had developed the system sufficiently to hold a more promising demonstration for the press. By 1929 it was possible to eliminate all mechanical moving parts from the system for the first time. In 1930 Vladimir Zworykin, head of television research for RCA, visited Farnsworth and was impressed with several aspects of the recently patented Image Dissectorcamera tube. Zworykin had also been struggling to design a practical all-electronic camera eye tube, and RCA was using 80 line mechanical scanning at that time. Zworykin called RCA's laboratory and had his assistants construct a near-identical copy of Farnsworth's Image Dissector tube which was finished upon his return to RCA. In 1931, then president of RCA (David Sarnoff) offered to buy Farnsworth’s patents outright, but was refused. Farnsworth sought only to license his patents, but this was against RCA policy. This stalemate led to a fierce and lengthy legal battle between Farnsworth and RCA. In June of 1931 Farnsworth instead joined the Philco company and moved his laboratory to Philadelphia, along with his wife and two children. Philco denied Farnsworth time to travel to Utah to bury his young son Kenny, who died in March 1932; this death put a strain on Farnsworth’s marriage and may have marked the beginning of his struggle with depression. Things became increasingly difficult. With close to unlimited financing, RCA's monopolistic position regarding television was strengthening, as RCA controlled more and more key patents, not to mention the manufacture of radio tubes. Philco was persuaded to sever its relationship with Farnsworth in 1934. In November 1936, Farnsworth travelled to England as part of a patent sharing agreement with John Logie Baird's company. The Baird company was in the midst of a competition with Marconi-EMI for forming an improved technical standard for the BBC television system. Rarely reported in popular accounts is the fact that the light sensitivity of Farnsworth's image dissector camera proved to be insufficient to assist Baird in the competition, despite the addition of an integral electron multiplier. In contrast, Farnsworth's receiver patents aided the Baird company tremendously in its design and production of electronic television receivers. During one patent lawsuit against RCA, Farnsworth's high school teacher redrew a drawing Farnsworth had made on the blackboard of the Image Dissector when he was 14. 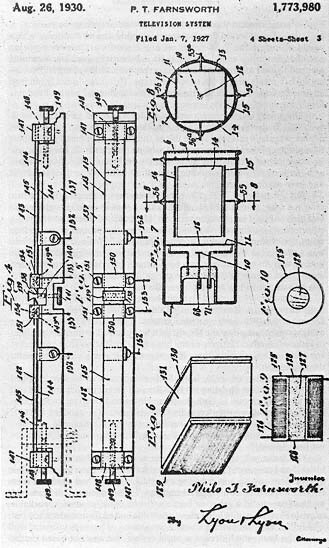 This drawing closely resembled earlier diagrams published by A.A. Campbell-Swinton, however, at the trial there was little question that Farnsworth had actually conceived of this apparatus before RCA, and Farnsworth won the suit. By 1939, the lawsuits were finally over. Farnsworth's company had licenced their patents to RCA. Unfortunately, Farnsworth's television company was mismanaged and had to be sold soon after the war, just prior to the boom in television receiver sales, and several of Farnsworth's key patents had lapsed. Farnsworth never became wealthy, but went forward to work in the area of nuclear fusion research. Farnsworth's key patents came into practical broadcast use soon after World War II to drastically improve television picture quality. Although the Image Dissector itself was never practical except to televise directly from film stock, later ideas from Farnsworth and those co-invented or modified later by RCA were widely applied in broadcasting, such as the Image Orthicon tube and the Farnsworth electron multiplier. A plaque honoring Farnsworth as "The Genius of Green Street" is located on the 202 Green Street laboratory in San Francisco, California. A statue of Farnsworth represents Utah in the U.S. Capitol building.